_ Whether for yourself or for a gift, I can etch initials, a name or a date on the blade of most knives. I can also do other designs, symbols, or logos. Etching starts at one hundred pesos. To purchase any of the knives I have available for sale, to place an order, to inquire about shipping, to ask a question or just talk, you can use the form below. If you’re in Merida, you are welcome to stop by my workshop and studio to see what I have available, but please call or email ahead of time to schedule an appointment. Or you can see my knives at a few select shops in Mexico (click here for a list of retail shops). I accept Mexican Pesos or US Dollars, for sales in Mexico, and US Dollars only, if ordering from outside of Mexico. If you are ordering via email, I can accept Paypal and Credit Cards. All prices are listed in Mexican Pesos. When you contact me to place an order, I will quote the current exchange rate as well as the current delivery schedule. Knives can be shipped almost anywhere in the world via FedEx. They will be shipped fully insured. For example, a folding knife can be shipped to Mexico City for approximately $200 pesos, or to Philadelphia, PA with delivery confirmation for about $42.00 US including insurance. When you inquire about a knife, please let me know the country and postal code you would like it shipped to, and I will quote a price for the knife and shipping. There is no duty or tariff levied on knives shipped to the USA. Orders shipped elsewhere outside Mexico may be subject to local taxes and customs. Customs forms for all international packages list the value of the contents as well as a description of the items. The recipient must pay any customs or import duties levied once the package reaches your country. Your local customs office will be able to provide further information. Every knife is created with pride and great care, and each piece has unique characteristics and imperfections that are inherent in hand craftsmanship and natural materials. Your knife will bring you years of enjoyment and will improve with age. However please bear in mind that no two pieces will be absolutely identical in terms of dimensions, finish or texture or color of natural woods, horns or leathers. There will always be an individual nature to every piece. Knives made of carbon steel will darken and stain over time, and will rust if not kept cleaned and oiled. Rust and stains can be removed with very fine steel wool or very fine grit (600) wet/dry finishing paper. Kitchen knives (even stainless) should not be left in water or washed in a dish machine. Wood and horn handles can be treated with a fine furniture oil or paste wax. I’m confident you will be pleased with your knife and I’m sure it will bring you years of enjoyment. However, just in case something is not right, you can return it within 10 days of purchase for a refund or exchange. The only thing I ask is that the knife issent back in the original box, with all labels attached, unused and undamaged. Please contact me prior to returning a knife for full instructions. 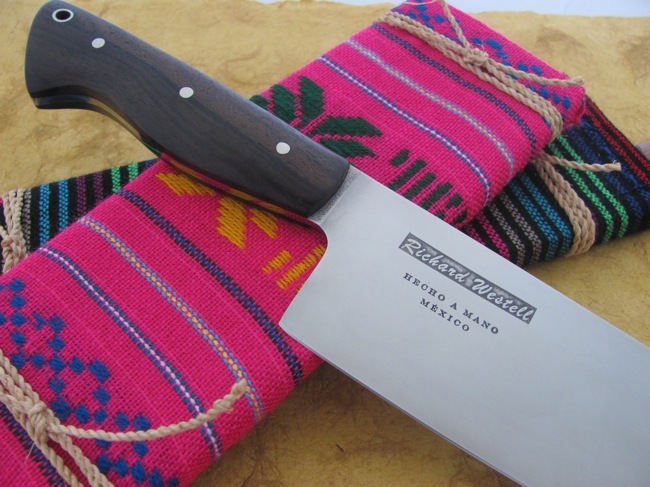 ****Please note that I cannot accept any returns or exchange on any custom designed or custom etched knives - these knives are non-returnable and non-refundable, unless for a defect.